DANA POINT, CA — At a time when restaurants are feeling the heat from new competitors and changing consumer demands, Jack in the Box's marketing head has advised brands to stay true to their roots rather than "forgetting who they are." Alter’s remarks were part of a presentation she and Bobby Pearce, chief creative officer of Jack in the Box agency David & Goliath, made at the ANA’s 2018 Brand Masters Conference exploring the chain’s long-standing stature as a challenger brand. Alter highlighted some of the chain’s recent memorable multiplatform campaigns, which she said were successful because they “embrace the challenger spirit” that promotes bucking convention, and being successful doing it. Roughly three years ago, for instance, the chain rallied enthusiasm for a new offering, a black pepper cheeseburger, by tapping Breaking Bad creator Vince Gilligan’s directorial skills for a commercial featuring Jack (he was revived as the company leader after the chain’s infamous 1993 E. coli outbreak) meeting a spice trader in the Mongolian desert. The spot was teased on Instagram; Consumers who called an unidentified phone number that appeared in the ad got the spice trader’s voicemail on the other end. A separate campaign targeted gamers, who notoriously hate advertising, by putting Jack in the Box-branded vehicles in the driving game Grand Theft Auto, a move that got traction with influencers and play on websites like Reddit, Alter said. Jack in the Box promoted a new latenight menu by partnering with Snoop Dogg, who had the character Jack as a guest on his cannabis lifestyle show Merry Jane and partnered on launching a limited time Merry Munchie Meal. 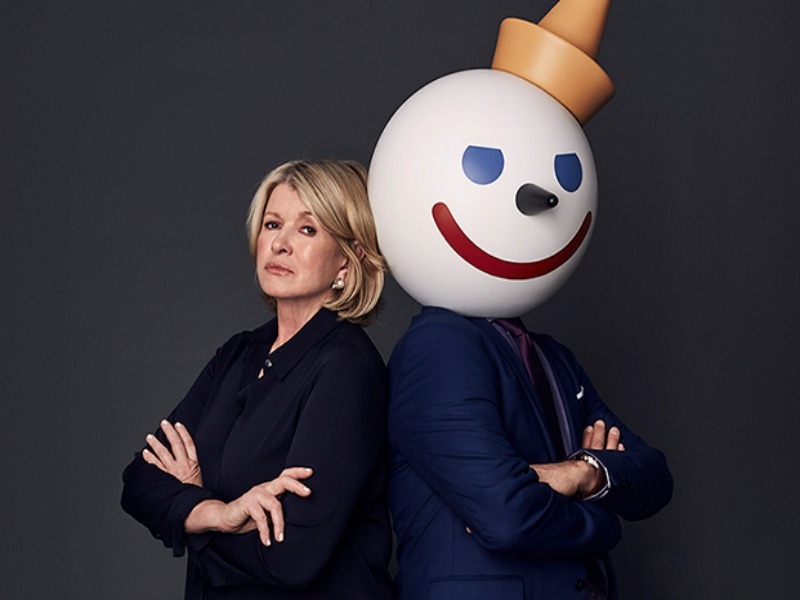 When Jack challenged Martha Stewart to try the chain’s new Asian chicken sandwich (and she refused) a Twitter war between the two pop culture icons ensued. Unveiling the world’s largest coupon, which measured 80’ x 20’, and calling on consumers to redeem it for a new Buttery Jack burger by showing a picture of it garnered 263 million impressions, and doubled the number of expected sales, making it the company’s most successful launch ever. Alter said those sorts of campaigns are successful because they are true to Jack in the Box’s roots as an innovator and challenger. “A lot of brands fail because they lose their way, they forget who they are,” she said. Pushing the envelope, however, comes with risks. Alter noted that failed ideas come with the territory.